Don’t Walk By is an annual outreach to serve our neighbors who are living on the street. Every Saturday in February, volunteers canvas the streets of Manhattan, meeting people and inviting them back to an anchor church where they are offered a hot meal, clothing, basic medical care, and an opportunity to connect with holistic recovery programs. 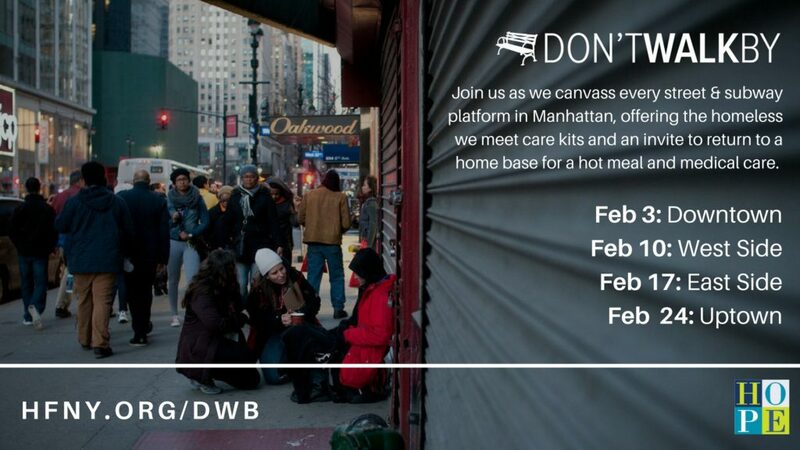 Don’t Walk By is an outreach of The Rescue Alliance, a collaboration of faith-based organizations working together to restore the well-being of men, women, and children in New York City who are experiencing homelessness. Visit hfny.org/dwb to sign up today!